Jungmann’s history of the Mass raises questions in the enquiring reader’s mind: Why should he have spent a decade of painstaking and meticulous research to produce a work that disparaged the faith and practice of virtually the entire history of the Church’s liturgy? What was Jungmann trying to achieve? His concern was to amass “evidence” to show that, soon after the early years of Christianity, the Church’s liturgy had become “doctrinally corrupt” in its theology of the Mass and the priesthood. His magnum opus was an endeavor of large proportions. It was as if he had set out to bury the Roman Rite under a complex web of falsehoods and was building an elaborate funerary monument or vast mortuary palace to commemorate its passing. But, of course, he did not succeed, no more than had the Protestants of the Pseudo-Reformation who embarked on the same quest. 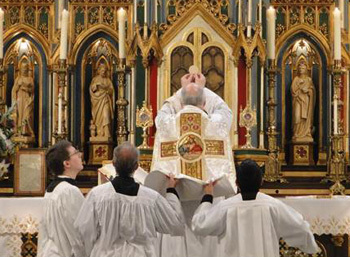 For the traditional Mass has unfailingly confirmed throughout the ages the Faith of the Apostles in the true meaning of the Holy Sacrifice, the Real Presence and their own priesthood. Where Jungmann did, however, achieve success was in influencing Church leaders and policy makers to accept his progressivist or neo-modernist ideas. His work is a prominent example of how the power of false rationalization drove the Liturgical Movement: As we shall see below, he provided theories about how traditional doctrines were to be understood in an ecumenical perspective, i.e., in a manner acceptable to those outside the Catholic Church and away from the true Faith. In fact, Jungmann’s theological thinking turned out to be remarkably similar to that of the 16th-century Protestants, nothing less than a rejection of the doctrine of the Mass as the Catholic Church has always understood it. 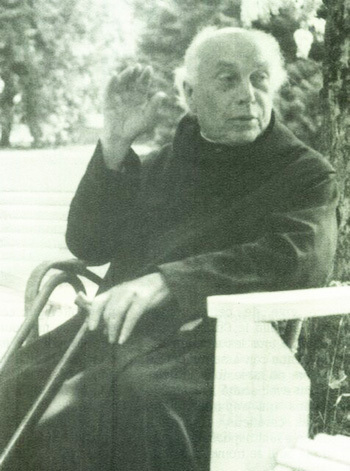 Jungmann’s privileged position as a consulter to Pius XII’s Liturgical Commission secured the adoption of some of his ideas for the 1955 Holy Week reforms. It is of the greatest significance that the rest would find a ready acceptance in Vatican II’s Liturgy Constitution (he was a member of the Preparatory Commission) and in the Novus Ordo Mass (he was a member of Bugnini’s Consilium). Thus stands revealed the direct link between the Modernism condemned by Pope Pius X and the fateful Article 7 of the 1969 General Instruction of the Novus Ordo, (1) which defined the Mass in a Protestant sense, as “the Lord’s Supper” and the gathering of the People of God. 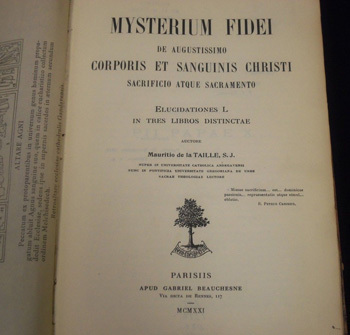 The theoretical antecedents for Article 7 go back to the early years of the 20th century to the publication of a book, Mysterium Fidei, (2) which was extremely influential in the Liturgical Movement. Its author, Fr. Maurice de la Taille, SJ, proposed, contrary to the teaching of the Fathers of the Church, (3) St. Thomas Aquinas (4) and the Council of Trent, (5) that the Mass does not contain any reality of immolation. This corporate model was termed by de la Taille the “sacrifice of the Church” to replace the sacrifice of Christ performed uniquely by the ordained minister. (7) It became the dominant perspective of the Liturgical Movement and was promoted by the key figures of the nouvelle théologie. One wonders how such a Catholic-sounding title as Mysterium Fidei was used for so Protestant-pleasing a book. But, then that is the modernist stock in trade. Accepted by whom? De Lubac’s terms of reference were limited to the narrow consensus of liturgical experts, but the broad swathe of faithful Catholics went on believing in the Mass as a mystical Mount Calvary, not a Protestant “Lord’s Supper” as Article 7 would indicate. In other words he was saying that the sacrifice of the Mass is not the self-same reality as the sacrifice of the Cross and that the mystical immolation that takes place in it is not a real and actual one. But here is the progressivist poison: if the Church commits her infallible authority to a doctrine that has no basis in objective reality, then, how can we believe that anything she teaches is true? 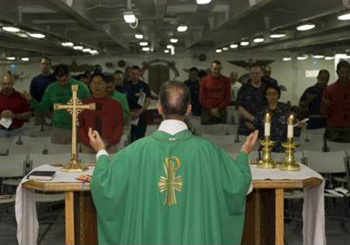 Jungmann stated: “Thinking of the Mass almost exclusively as a sacrifice is a one-sided attitude resulting from the doctrinal controversies of the 16th century.” (18) Here the progressivist poison is injected: his readers are to take home the message that the Mass as a real sacrifice was not of Apostolic origin. 2. M. de la Taille, Mysterium Fidei, Paris, G. Beauchesne, 1921. St Augustine, for example, taught that a real immolation takes place in the Mass: “Was not Christ immolated only once in His very Person? 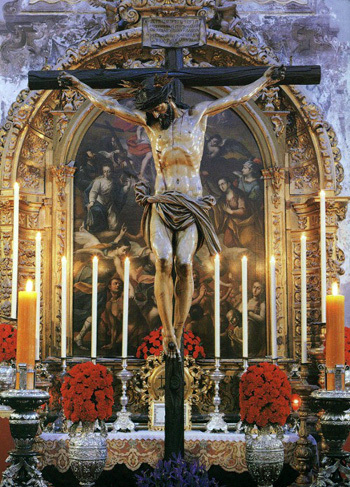 In the Sacrament, nevertheless, He is immolated for the people not only on every Easter Solemnity, but on every day; and a man would not be lying if, when asked, he were to reply that Christ is being immolated” (Letters 98:9). With reference to the Eucharist, St. Thomas Aquinas says: “It is proper to this Sacrament that Christ should be immolated in its celebration,” for the Old Testament contains only figures of His Sacrifice (Summa, III, 83, 1). Fr. de la Taille stated: “The authors of the sacrifice, in a manner that is proper and personal to them, are the faithful whose gifts are by the priest’s hands addressed to God under the form of the Body and Blood of Jesus Christ”(The Mystery of Faith and Human Opinion, New York: Longmans, Green and Co., 1930, p. 134). Fr. de la Taille stated: “The power and the act of sacrificing passes from the Head to the body” (Mysterium Fidei, vol. 2, p. 193). E. L. Mascall, Christ, the Christian and the Church (London: Longmans, 1946), p. 168 apud Francis Clark, Eucharistic Sacrifice and the Reformation (London: Darton, Longman and Todd, 1960), pp. 263-264. Prominent among those who opposed de la Taille were Fr. Alfred Swaby, “A New Theory of Eucharistic Sacrifice, American Ecclesiastical Review, 69 (1923), pp. 460-47 3; Fr. Vincent McNabb, “A New Theory of the Sacrifice of the Mass,” Irish Ecclesiastical Review 23 (1924), pp. 561-573; and Dom Anscar Vonier, Abbot of Buckfast Abbey, A Key to the Doctrine of the Eucharist (London: Burns, Oates & Washbourne, 1925). Karl Rahner opined: “What is it that makes the properly historical in studies like those of de Lubac or de la Taille so stimulating and to the point? Surely it is the art of reading texts in such a way that they become not just votes cast in favour of or against our current positions (positions taken up long ago), but say something to us that we in our time have not considered at all or not closely enough about reality itself.” “The Prospects for Dogmatic Theology,” in Theological Investigations, vol. I (Baltimore: Helicon Press, 1961), pp. 9-10. Karl Rahner, “Latin as a Church language,” in Theological Investigations, vol. V (London: Darton, Longman and Todd, 1966), p. 397. H. de Lubac, The Mystery of the Supernatural (Herder and Herder, 1967), p. 4. Jungmann, The Mass of the Roman Rite, vol. 1, p. 184. Ibid. But St. Thomas Aquinas had already disproved this point in the Summa ( q. 85, art. 3) when he said that “every immolation is an oblation, but not conversely,” i.e., not every oblation is an immolation. Jungmann, Announcing the Word of God, trans. from the German by Ronald Walls (London : Burns & Oates, 1967), p. 112.